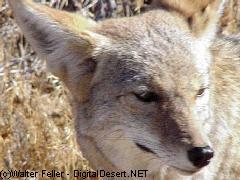 Intelligence puts coyotes in a class by themselves. They are smart animals, and have learned to take advantage of man and engage in creative hunting. There are stories of coyotes creating diversions, luring prey into killing distance, or picnickers away from their lunches. They've also been known to scare rabbits into passing vehicles thereby avoiding a chase which may or may not prove fruitful.